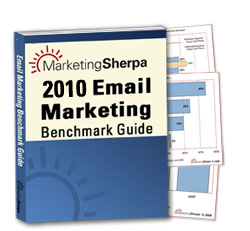 2009 Email Marketing Benchmark Survey – 1,493 real-life marketers from a range of business and consumer-focused firms answered our extensive survey (and some discussed their answers in follow-up calls) in August and September of 2009. Discover how your internal tactics and stats match up against the norm. You may be surprised. Special Report on Social Sharing – Social media has taken the marketing world by storm, and its effects extend to email. This section looks at the effect and tactics of ?social sharing‘ while putting the role of social in perspective for direct marketers. Special Report on Consumer Attitudes – Marketers have one idea of what Spam is, consumer have another. Get insight into their views and how they use email differently today from in the past, thanks to this survey conducted in partnership with QInteractive. Focus on Business to Business Email Marketing – The problems and opportunities of B2B are unique. This chapter explores how the role of email is integral and changing in marketing to the long sales cycle. Year Two of Sherpa’s International Email Study – For many organizations, marketing overseas has gone from the back burner to an essential opportunity for growth. Learn how your peers are looking out of the country for new names and customers. The Business of Search – From the effects of the slowing economy to how different types of companies are budgeting and spending for search, this section covers the intersection between expense and opportunity. The Tactics of Search – Each year brings new ways of using or understanding search. In addition to the increasingly important role of demographics, geo-targeting, local and mobile, this year we take a deep look at the enigmatic relationship between search and brand. Search Providers and Searcher – The guide goes behind the scenes of top general and vertical search players, and takes a look at secondary players as well as the international search engines, with an emphasis on the rapidly maturing Asian market. We also take a look at the other side – the searchers who power the industry and their evolving needs. Measuring and Testing – As the cost of search rises, the need for learning, measuring and testing grows. Search regularly ranks among the top tactics in terms of the return on investment. 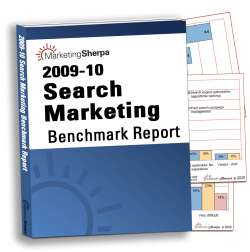 Search Benchmarks – All of the fundamental metrics of search marketing, fully updated and in one place, including costs-per-click, keyword prices, volume and conversion rates. many outside sources, many of whom have provided exclusive data to MarketingSherpa. 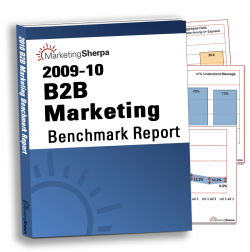 The ‘B2B Marketing Benchmark Report 2009-10’ features brand new primary research compiled from 2,631 marketing professionals like yourself. With the convergence of multiple mediums coupled with today’s volatile economic climate, it’s critical that B2B marketers understand and use available data more effectively than ever. Economic recovery? 47% of B2B marketers are optimistic that the economy will recover in 2009. The expectations of better days ahead will mean a change in marketing objectives and the strategies required to achieve them for 2010. Search marketing is generating the bulk of B2B leads, but are they good leads? Find out more on the balancing act between quantity and quality. B2B is ahead of B2C in the adoption of social media. Find out why B2B marketers are leading the charge.